Wealth taxes are now rising fast up the global political agenda. 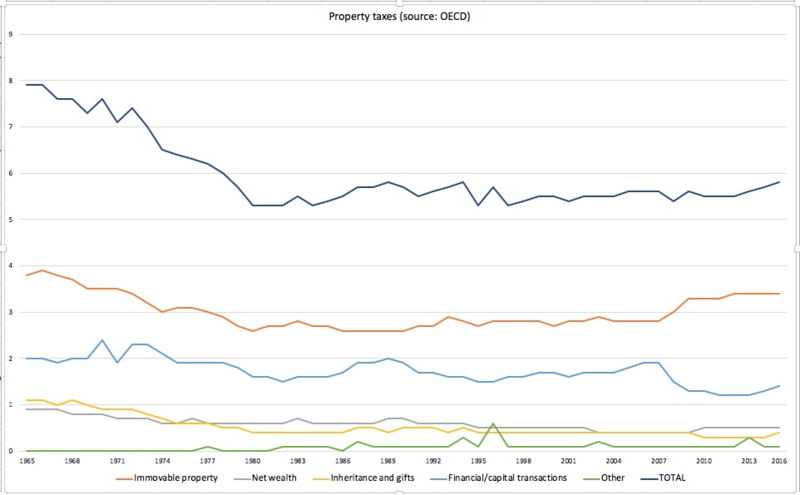 For OECD countries, taxes on “property” have declined as a share of all taxes, from close to eight percent of all taxes in the 1960s, to a little over five percent in 1980, a level at which they have stagnated ever since. The graph above is quite striking, for several reasons. The big surprise in this case is that all the justifiable political anger that has followed the global financial crisis – a crisis created by global élites – has not translated into meaningfully higher wealth or property taxes. But the public mood seems to be steadily shifting, in a number of countries. One place where this is happening is the UK, where two new reports, one after the other, make the case for wealth taxes. The first came from the IPPR, a progressive British think tank, with a fine report entitled A Wealth of Difference: Reforming the taxation of wealth. that trusts are reformed to be more transparent. replace business rates with a land value tax. We are in general agreement with all of this, with a couple of provisos. First, on inheritance taxes, one needs to be very careful striking out one revenue-raising measure from unearned wealth, in case that the alternative gets derailed. Will taxing the recipient be harder to avoid than otherwise? Probably yes, in the main. But this won’t solve all problems. It won’t necessarily address the issue of “ownerless assets” in trusts, especially offshore trusts, where the asset has been given away into the trust, but not received by anyone yet, and is sitting in some sort of limbo – yet with various parties still having the power to enjoy or control that asset. (For example, Daddy’s put his mansion into a trust structure, and the trusts’ rules allow the children full use of the mansion, without them actually owning any of it.) Any discussion of trusts soon gets into the weeds – and this applies to the requirement to make trusts more transparent: the recommendation is quite right, but the details are squirrelly. See our report on trusts for more. Taxing all income from wealth under the income tax schedule is an excellent idea. (Why should wealth be prioritised over hard work?) Land Value Tax is another great tax, whose time has come. We support it wholeheartedly, as part of a comprehensive tax system. Work is also needed, the report continues, to ensure that the Budget doesn’t disadvantage women. Quite so. And there’s plenty more. Here is Tax Justice UK’s proposed way to raise more money. It should be noted that the corporate tax rate that TJN UK took here was not an endorsement of a 20 percent tax rate for the UK – we have always said it should be very substantially higher – this is merely taken to be an example of one way that some money could be raised, to reach that £20 billion spending target. A much higher rate would obviously raise a lot more, and would also make the UK a more prosperous place. For a fuller discussion of these issues, see TJN’s document Ten Reasons to Defend the Corporate Income Tax, and also the finance curse analysis, which puts it into a broader context. In short, the time for wealth taxes has come.